PCE-2000 (type D impact) portable hardness tester is used to quickly test the surface hardness of metalic materials according to the parameters Rockwell B & C, Vickers HV, Brinell HB, Shore HS and Leeb HL. 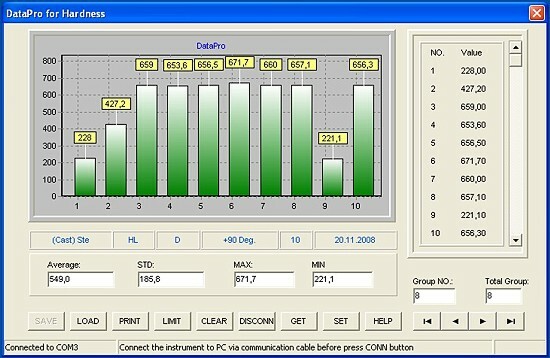 The hardness tester has a statistics function, a data storage function, and the interface R-S232 to send data to the PC (software and cables included in the shipment). The hardness tester can be used in any position, including on a mount, with angle selection and adjustment. The striking unit fits easily on top of the item being measured. With the external digital indicator showing all the functions and readings, there is no way of making errors in the measurements. Technical specifications can be found further down on this page. If you wish to acquire a hardness tester for metals without an interface, memory or software, click here. If you are looking for a hardness tester which uses an impact method of measurement, click here. The dynamic measurement process uses the difference between the rebound velocity of a small striking pin. This is shot from the device at the metal surface being measured by way of a tension spring. The following link has an explanation of the hardness testing process. Like the PCE-2000 (impact D) hardness tester, it comes with an RS-232 interface, which can be connected to a computer to allow for the data to be archived. Data saved to the memory of the device can also be sent to a computer for analysis and documentation. You will find software in the optional accessories further down on this page. Minimum weight of the moving component 2kg in stable position / 0.05kg with coupling gel. The standard hardness tester includes an RS-232 interface cable. The adaptor allows you to send data online or later to a computer. 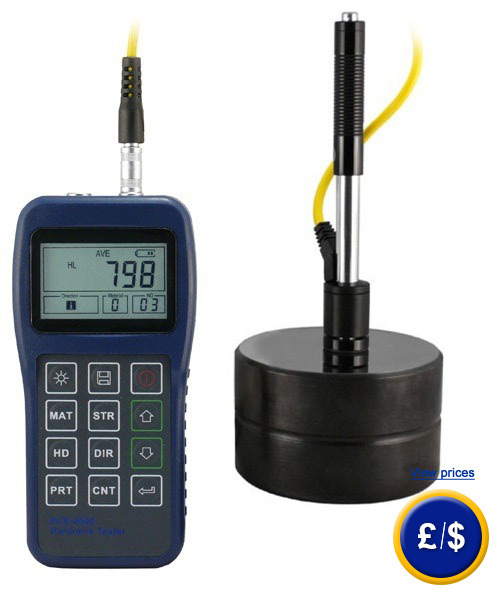 The calibration certificate includes a laboratory calibration wtih a document containing all the measurement values. This allows for an annual recalibration. For concaved and convexed surfaces as well as an adaptor for radius. With these adaptors you can measure the insides of tubes.